Not all POS’s are the same. Some systems offer features that are better for one industry and worse for another. That’s why we’ve put together this showdown between two major POS players - ShopKeep and Lightspeed - to help you decide which one is better for your business. In this corner, weighing in as heavy in the POS arena we have ShopKeep. And in this corner we have Lightspeed, the company that pride's itself on POS speed. Let the fight begin! The price point of any POS service can be its best (or worst) feature. For smaller, independent stores, your retail space alone may take a chunk of your profit, so you want to make sure that all your other outlays are working as hard as possible for you. We love ShopKeep’s flat-rate monthly fee of $69 a month for your first register, and then $39 a month for each additional register - so you won’t ever pay for a register you don’t want or need. Winner: ShopKeep - order as many registers as you need, and you don’t pay for what you don’t use. 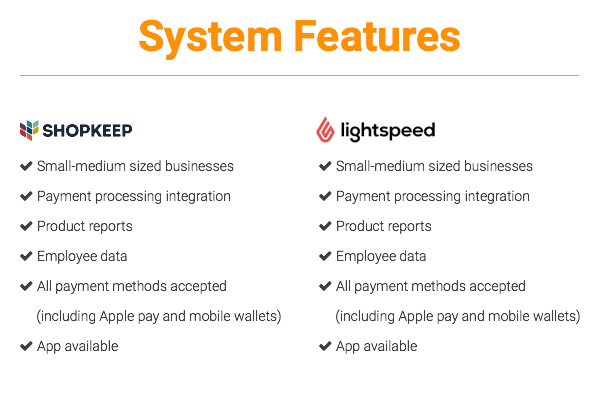 When it comes to features, both LightSpeed and ShopKeep really pack a punch, offering a range of highly detailed features tailored specifically for small to medium-sized retail businesses. ShopKeep provides total payment processing (PP) integration and accepts absolutely all types of payments - including non-traditional methods such as Apple Pay and mobile wallets. In addition, you can track your business’ real-time data from anywhere, anytime via the cloud (with the ShopKeep App). But LightSpeed one-ups ShopKeep in this area. They not only offer simple PP integration, product reports, and data on employee performance (just as ShopKeep does), they also provide completely coordinated omnichannel solutions so you can keep tabs on multiple store locations - including your e-commerce store - all at the same time. Winner: Lightspeed - you can seamlessly manage your online and retail shopfronts at exactly the same time. ShopKeep’s contract terms make implementing a POS an almost completely risk-free process. They only charge month-to-month, and allow customers to cancel at any time - which is great news for retail business owners whose needs can change very quickly. If a retail POS system has problems, you can bet there will be plenty of negative user reviews. But if it’s great, customers will be raving. So between LightSpeed and ShopKeep, who really wins the hearts of their clients? Despite good intentions LightSpeed has had some technical difficulties in the past - resulting in POS systems going down (which can be very frustrating if you’re in the middle of a high-volume shift). This led to some poor user reviews which slightly brought down Lightspeed’s online image. ShopKeep on the other hand has a seriously loyal following stemming partially from their 24/7 customer support. And with no widespread issues reported to date, it takes the upper hand in this area. Winner: ShopKeep for its excellent reviews. After seeing both ShopKeep and Lightspeed go head to head, we have to say that this battle was a close call. Both systems scored higher in some areas but lower in others, but ShopKeep POS came out as the clear winner and better choice for retail businesses. Head over to ShopKeep's website for more information and find out if your business can benefit from a POS.